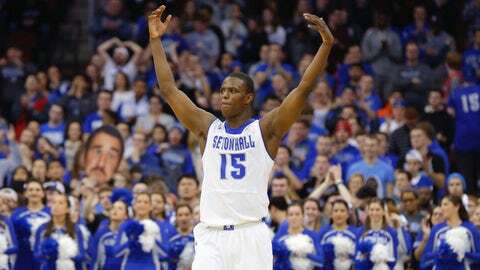 Isaiah Whitehead and the Pirates vow to stay off social media. Don’t bother tweeting or tagging anyone on Seton Hall this season, the Pirates swear they aren’t looking. Isaiah Whitehead, a sophomore guard who is a preseason all-Big East second team selection, told Zach Braziller of the New York Post that the team has unanimously decided to give up social media (unless it’s simply posting a photo to Instagram) for the duration of the 2015-16 season as a way to limit distractions. Whitehead says the ban will go into effect at the end of the month. "The one negative can break up a team so easily," Whitehead said during Big East Media Day on Wednesday morning at Madison Square Garden. "I think staying off of it will be good. Just trying to focus on the season. … Coach loves it. He thought it was a great idea. Last season, the Pirates knocked off Villanova and St. John’s, both ranked opponents, to begin conference play. Those two home wins reignited the fan base and launched Seton Hall into the top-25. However, Seton Hall finished the final month-and-a-half of the season losing nine of the last 10 games, finishing seventh in the league standings. The Big East preseason coaches’ poll picks Seton Hall to finish in the same spot again this year, but a renewed focus, matched with the talented core of sophomores could make the Pirates a dangerous team. Seton Hall open the 2015-16 season on Nov. 13 against Dartmouth.